WELCOME BACK FOR ANOTHER TECHY TUESDAY! THIS WEEK I'M SHARING A TUTORIAL FOR CREATING YOUR OWN REPEATING PATTERNS THAT ARE PERFECT FOR MAKING YOUR OWN PATTERNED PAPERS. THIS TUTORIAL WILL SHOW YOU TWO WAYS TO CREATE PATTERNS, ONE FOR SIMPLE REPEATS, AND ONE FOR IRREGULAR, ALL OVER REPEATS. IF YOU'RE MAKING YOUR PATTERNED PAPER FOR SCRAPBOOKING, GO AHEAD AND SIZE IT TO THE PAGE YOU INTEND TO MAKE. I CREATED A 12" X 12" DOCUMENT IN 300 DPI SO IT WOULD BE HIGH RESOLUTION FOR MY CUSTOM PATTERN! DECIDE THE SIZE OF YOUR REPEAT AND SET GUIDES BY DRAGGING A NEW GUIDELINE FROM THE RULERS AT THE SIDE OF YOUR WINDOW. IF YOU DON'T HAVE RULERS SET UP YET, GO TO 'VIEW' AND CLICK 'RULERS' OR USE THE SHORTCUT (COMMAND + R) TO MAKE THEM APPEAR. SET THE GUIDES TO CREATE A SQUARE SPACE FOR YOUR DESIGNS TO BE MADE IN THE UPPER LEFT HAND CORNER. I'VE MADE MY REPEAT SIZE 3" SO HAVE SET MY GUIDES AT THE 3" MARK BOTH VERTICALLY AND HORIZONTALLY. FOR THIS SIMPLE REPEAT YOU'LL NEED A SHAPE THAT CAN BE CENTERED ON YOUR REPEAT SQUARE, I'VE CHOSEN THIS HAND SKETCHED MEDALLION SHAPE AND CLEANED IT UP IN PHOTOSHOP. YOU CAN DO ANYTHING LIKE POLKA DOTS OR FLOWERS ETC. AT THIS TIME, MAKE A SHAPE OR BRING YOUR ARTWORK INTO YOUR DOCUMENT AND SIZE IT TO FILL YOUR REPEAT SIZE. AS YOU CAN SEE BELOW, I HAVE SIZED MINE TO FILL THE HORIZONTAL 3" AND LET THE SHAPE SIT NICELY WITHIN MY 3" REPEAT. HOLD (ALT) DOWN AS YOU CLICK AND DRAG YOUR SHAPE TO A NEW LOCATION. YOU CAN CHOOSE TO DO AN OFFSET REPEAT LIKE I HAVE HERE, OR SIMPLY A STRAIGHT REPEAT BY DRAGGING THE SHAPE DIRECTLY TO THE RIGHT IN THE SAME 3" ROW - THIS IS TOTALLY UP TO YOU! NOTE: YOU CAN ADD MORE GUIDELINES IF YOU'RE HAVING TROUBLE WITH SPACING YOUR NEW REPEATING SHAPES. ONCE YOU HAVE THREE OBJECTS SPACED PROPERLY, SIMPLY DRAG THE THREE OVER (WHILE HOLDING ALT) TO REPLICATE THEM. DRAG TO WHERE THE LEFT MOST SHAPE IS LAID OVER THE PREVIOUS RIGHT MOST SHAPE. THIS WILL ENSURE THAT YOU HAVE PROPER PLACEMENT WITH THE EXACT SPACING NEEDED FOR THE PATTERN TO BE PROPERLY REPEATED. ONCE YOU HAVE A FULL ROW ACROSS OF OFFSET SHAPES, SIMPLY REPLICATE THEM DOWNWARDS USING YOUR SPACING CLUES TO FINISH OFF THE PATTERN UNTIL YOUR 12" X 12" CANVAS IS COMPLETELY FILLED. TO MAKE THE PAPER MORE SYMMETRICAL, I PULLED THE SHAPES OVER TO THE LEFT TO KEEP THE AMOUNT OF PATTERN SYMMETRICAL ON EACH SIDE OF THE PAGE. THIS IS OPTIONAL BUT WILL LOOK BEST WHEN PRINTING YOUR PATTERNED PAPER. ONCE MY PATTERN IS DECIDED, I SAVE ONE VERSION AS A PHOTOSHOP FILE SO I'LL ALWAYS HAVE THE OPPORTUNITY TO CHANGE THE REPEAT OF MY PATTERN LATER ON. I THEN LIKE TO MERGE THE LAYERS AND SAVE AS A HIGH RESOLUTION JPEG. JUST LIKE BEFORE, IF THIS IS FOR A STANDARD 12" X 12" PAPER YOU'RE CREATING, YOU'LL WANT TO CREATE A NEW PHOTOSHOP DOCUMENT SIZED PROPERLY AT A MINIMUM OF 300 DPI. TO CREATE AN ALL OVER FULL PAGE PATTERN THAT ISN'T A CENTERED SHAPE WITH WHITE SURROUNDING IT, YOU'LL WANT TO CREATE YOUR REPEAT SHAPE GUIDES AWAY FROM THE EDGE OF THE PAPER SO YOU HAVE ROOM TO WORK WITH THE REPEAT. 1" SHOULD BE PLENTY AND WILL ALLOW YOU TO BALANCE THE PATTERN FOR REPEAT. AGAIN, I'VE CREATED A 3" REPEAT SIZE BUT YOU CAN MAKE YOUR REPEAT AS SMALL OR AS LARGE AS YOU WANT. DRAG THE DESIGNS OR SHAPES YOU WANT YOUR PATTERN TO BE MADE OF INTO YOUR CANVAS AND SIZE THEM TO FILL THE REPEAT SQUARE COMFORTABLY. MAKE A DESIGN YOU'RE HAPPY WITH KEEPING IN MIND THAT YOU WANT ELEMENTS TO EXTEND PAST THE EDGE OF THE SQUARE SO THAT THEY CAN BE RE-ARRANGED TO CREATE A SEAMLESS PATTERN. MOVE TO THE NEXT STEP SO YOU'LL FULLY UNDERSTAND HOW TO DO THIS! FOR YOUR PATTERN TO BE AN ALL-OVER, SEAMLESS PRINT, YOU HAVE TO MOVE SHAPES FROM THE OUTSKIRTS OF THE GUIDES INTO YOUR REPEAT, BUT ON THE OPPOSITE SIDE. SO, FOR EXAMPLE, ANYTHING THAT SURPASSES THE SQUARE REPEAT SHAPE ON THE RIGHT SIDE, WILL BE REMOVED AND PLACED IN THE EXACT LOCATION WITHIN THE REPEAT NOW ON THE LEFT SIDE. FOR YOU TO UNDERSTAND, I'VE BROKEN DOWN THIS STEP INTO 6 SUB-STEPS BELOW SO JUST KEEP READING! 4.1 FIRST, SELECT ONE SIDE OF OUTLYING SHAPES FULL WITH THE SELECTION TOOL. 4.2 CUT THE SHAPE YOU'VE JUST SELECTED. AS YOU CAN SEE ABOVE, I'VE SELECTED THE ENTIRE RIGHT SIDE OF MY REPEAT SHAPE SO THAT ANYTHING THAT IS OUTLYING THE SQUARE CAN BE MOVED. AT THIS TIME YOU'RE SIMPLY SELECTING -> EDIT -> CUT FROM THE DROP DOWN MENU (OR COMMAND + X) TO REMOVE THE SELECTION. 4.3 PASTE YOUR CUT SHAPE IN PLACE BY GOING TO THE DROP DOWN MENU -> EDIT -> PASTE SPECIAL -> PASTE IN PLACE. ALTHOUGH WE NO LONGER WANT THE SHAPE ON THE RIGHT HAND SIDE OF OUR REPEAT, WE WANT TO ENSURE THAT WE KEEP THE EXACT HORIZONTAL COORDINATES SO THAT WHEN REPEATING THE SHAPES WILL LINE UP EXACTLY. FOR NOW PASTE IN PLACE AND YOU SHOULD NOTICE YOUR SHAPE IS ON A NEW LAYER. 4.4 USE YOUR ARROW BUTTONS TO MOVE THE SHAPE TO THE OPPOSITE SIDE OF THE BOX SO THAT WHEN YOU USE YOUR REPEAT, THE SHAPES WILL MATCH UP FROM SIDE TO SIDE. USE THE SIDE ARROW KEY ONLY, AS I MENTIONED THIS WILL KEEP THE HORIZONTAL COORDINATE PRECISE AND YOU'LL JUST CHANGE THE VERTICAL COORDINATE. THINK OF IT THIS WAY, WHEN YOU DRAG THE SQUARE NEXT TO ITSELF ON THE SIDE YOU JUST REMOVED THE LEAF FROM, THAT LEAF WILL NOW BE EXACTLY HOW IT WAS AND WILL FILL IN THE PATTERN SEAMLESSLY. 4.5 YOU'LL WANT TO REPEAT THE CUT, PASTE, SHIFT PROCESS FOR ALL FOUR SIDES OF THE OUTLYING SHAPES. IF YOU'RE UNHAPPY WITH HOW THE SHAPES APPEAR ON THE OPPOSITE SIDE AS YOU MOVE THEM, SIMPLY ROTATE OR CHANGE THEM AS YOU GO! IT'S ALL ABOUT BEING HAPPY WITH YOUR END RESULT. AS YOU CAN SEE BELOW, I'M CHANGING THE TOP LEAF SHAPE BECAUSE WHEN MOVED TO THE BOTTOM OF THE REPEAT SQUARE, IT DIDN'T HAVE ANY ROOM AND SIMPLY SAT ON TOP OF THE CURRENT ROSE SHAPE, WHICH I DIDN'T LIKE. 4.6 ONCE YOU'VE REPEATED THE STEPS (4.1 - 4.4) YOU'LL SEE WHAT YOUR FULL PAGE PATTERN WILL BE. IF YOU'RE PLEASED WITH WHAT IT LOOKS LIKE, THEN YOU'RE READY TO MOVE ON TO CREATING A FULL PAGE PATTERN REPEAT, IF YOU'RE NOT, ADD IN OR CHANGE SHAPES UNTIL YOU ARE HAPPY, MAKING SURE TO REPEAT THE STEPS SO THAT THE SHAPES YOU'RE ADDING FIT WITHIN THE SPACE AND LINE UP PROPERLY! HERE YOU CAN SEE I'VE ADDED EXTRA SHAPES TO FILL ANY GAPS, AND SHIFTED THE SIZE AND PLACEMENT OF A FEW THINGS TO ENSURE I LIKE THE OVERALL PATTERN. ONCE YOU'RE PLEASED WITH YOUR REPEATING SHAPES, SELECT ALL THE LAYERS OF YOUR SHAPES AND MERGE THEM. THIS WILL MAKE IT EASIER TO REPLICATE YOUR PATTERN INTO A FULL PAGE PATTERNED PAPER. TO REPLICATE YOUR PATTERN REPEAT CLEANLY, FIRST REMOVE YOUR GUIDES BY DRAGGING EACH ONE OFF THE PAGE. THIS WILL ALLOW YOU TO SEE YOUR PATTERN SEAMS MORE CLEARLY. THEN, REPLICATE THE SHAPE TO ALL FOUR SIDES BY HOLDING ALT AND DRAGGING THE SHAPE TO MATCH UP WITH THE EXISTING PATTERN. HERE I HAVE ONE SEAM TO THE LEFT, THAT I CAN SEE NEEDS TO BE SHIFTED ONCE I REMOVED THAT GUIDE THAT WAS THERE. NOTE: FOR SMALL SHIFTS IN PLACEMENT, I LIKE TO USE MY ARROW KEYS BECAUSE IT PROVIDES SMALL SHIFTS THAT ARE MORE EXACT. I ALSO LIKE TO STAY ZOOMED IN SO I CAN BE SURE EVERYTHING IS MATCHING UP CLEANLY. BECAUSE YOU'VE CREATED A SEAMLESS SQUARE REPEAT, ALL YOU HAVE TO DO IS KEEP LINING UP THE SQUARES UNTIL YOU HAVE A FULL PAGE OF PATTERN. THE NICE THING ABOUT THIS PROCESS IS, ONCE YOU HAVE THE REPEAT FIGURED OUT, YOU CAN ALWAYS SCALE IT UP OR DOWN AND CREATE A PRINT AS LARGE OR SMALL AS YOU WANT! IT'S PRETTY COOL, AND THE HIGHER THE RESOLUTION OF YOUR INITIAL ARTWORK AND CANVAS, THE BIGGER YOU CAN MAKE IT (THINK POSTER SIZE!) 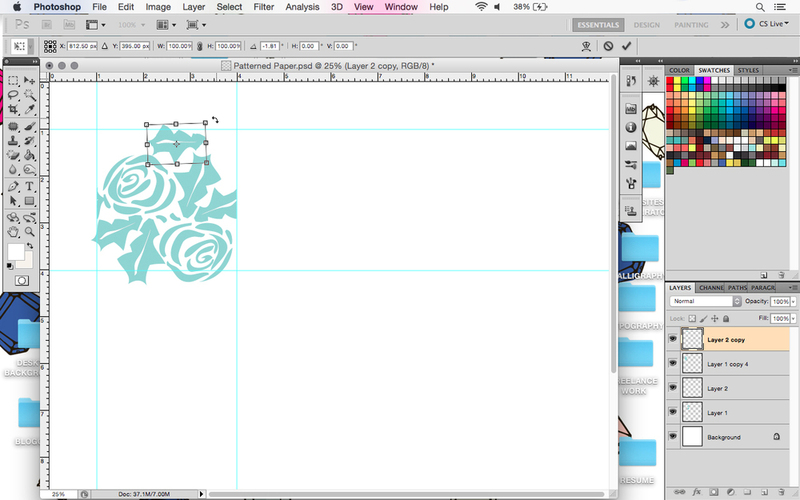 ONCE YOU'RE HAPPY, SAVE IT AS A .PSD AND A JPEG SO YOU'LL HAVE EVERYTHING YOU NEED ON HAND FOR THIS PATTERN.